Find out which teams came out on top in the WGLNA Saturday Slam. The WGLNA Season 2 sailed into the “Saturday Slam,” a unique weekend match day that featured all teams in the WGLNA. For most teams, this was yet another important step on the way toward qualification for the playoffs. However, if Apex could secure a win, they would also be in 1st place and top seed. Could o7 take down the league leaders and improve their chance for a playoff spot, or would this be yet another 5-0 to add to Apex’s mantle? 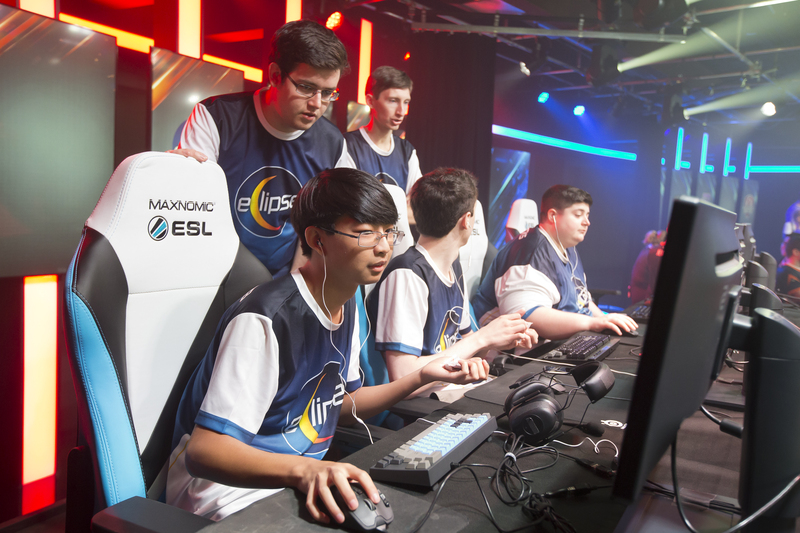 Other matches would see eClipse take on the challenge of Aquatic M60, Valence square off with a surging Top Tier, and Rival – Simple Tankers looking for that elusive first win against the hungry third place team, Dare Rising. With this being the last competition night shared by all eight teams, would this shakeup the positions in the league, or would the status quo be upheld? Dare Rising came into this match needing a full three points to keep up the pressure on eClipse, who stood just one point ahead. They came out quickly, securing a 1-0 lead on Murovanka. The second match had Rival on the attack. Early on, Chase_Potato was playing his role as scout to the hilt. He had found a bush just meters off the south cap and held that position for over five minutes. Although in the end he was brought down by a clinical set of shots, he made sure to light up most of Rival first. However, any advantage Rival gained from this had quickly disappeared as Night drove directly towards the cap and was swiftly cut to pieces. Dare would carefully dissect the rest of their foes to make the score 2-0 going into Prokhorovka. In the first battle, Rival took an early aggressive approach, sweeping over the rail line and taking out Aggressor. Although they maintained the pressure, Dare Rising managed to keep the HP totals fairly even. The match was reduced to a one-versus-two scenario, with MactepPutin left to face two remaining opponents alone. He would not be denied and was able to finish both of them off in short order to give Dare Rising the 3-0 lead. Dare Rising ended up taking the second Prokorovka battle, giving them match point as both teams prepped for Match 5 on Ruinberg. Dare chose to secure the north cap early, and while Rival - SimpleTankers set up well for the attack, Dare was already in place. Another victory for Dare meant they could potentially vault into second if eClipse faltered against Aquatic M60s. Both teams were coming off wins as we moved into the second match of the evening. Valence found themselves in 7th place and knew that without a win the chances of playoffs would be greatly hindered. Top Tier, having amassed a two-match win streak, stood to keep themselves in that very tight race for 2nd place with another victory. Top Tier swung out to a quick 2-0 lead by sweeping Ghost Town. Yet Valence demonstrated their own map dominance as they swept right back, taking both Himmelsdorf matches and tying things up at 2-2. On Murovanka, Rude_Awakening and his team would shut the door on any chances Valence had at winning both. In the end, Mines would go to Top Tier as well, winning the match set with a score of 5-2. Aquatic M60s began the evening just one point behind eClipse, who was in 2nd place. No better opportunity could be presented as one of eClipse’s key players, Vetro, was not playing. This meant that Drawk, who had not played in the WGLNA all season, would be stepping up. After the first four matches, the scores were tied 2-2 as eClipse swept the first two battles on Murovanka, only for Aquatic to return the favor on Mines. Prokhorovka would prove no different as both teams split to make the scores even at 3-3. Ghost would be the difference maker, however. In the end, eClipse would take both matches and the series. Even without Vetro, eClipse took the victory and Drawk was more than up for the challenge in keeping his team in 2nd place. Facing Apex this season has not been a pleasant task for most teams. Only eClipse has managed to push our reigning champions. O7 were desperate for points, as a win would be a major step in qualifying for playoffs. Apex would find a few isolations early, taking the lead in the first battle. However, in the second Prokhorovka match, Apex found themselves in a messy brawl that made the HP lead swing back and forth. O7’s Makos found himself alone in a battle against Oxmathus and Nitts, who had the HP advantage. With Makos going in with only four shells, Nitts was able to secure the win for Apex. After taking the first match on Ruinberg and the 3-0 lead, Apex would bring out the two-Maus strategy. It proved useful, as Apex secured a cap victory that resulted in a 4-0 lead. Apex would continue the pressure into the next match, taking the 5-0 victory and securing the 1st place bye and top seed for the WGLNA Season 2 finals. On the other side of things, o7 still stands four points over Valence and looks like a solid bet to take the last playoff spot at the very least. 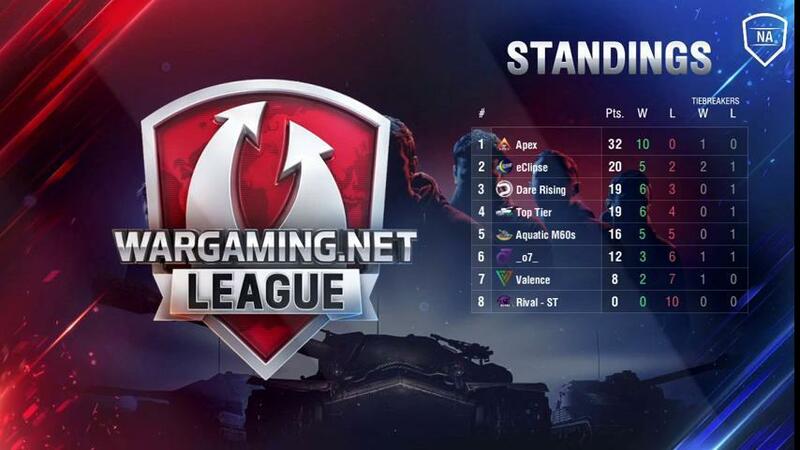 WGLNA Team Standings as of February 13th. Match Night 11 resulted in three teams just one point off from one another. A major match between Top Tier and eClipse is set for this Tuesday, February 14th. Can Top Tier push eClipse out of 2nd place, or will eClipse hold onto their ranking, earning the prize of a bye and a direct trip to the finals? Tune in and join in the fun this Tuesday at live.wgleague.net for more exciting WGLNA action!